Coffee trees produce Coffee Beans on their branches. These beans ripen at different times. While some producer have tried automation to harvest the beans, most growers of higher grade coffee harvest the beans by hand. This is a painstaking process as only the ripened beans are picked at any given time. These are called “Cherry.” It is a very labor intensive process. It is often difficult to find workers for the harvesting of coffee beans. On average a good worker can pick 150 lbs of ripened cherry per day and that will yield about 30 pounds of roasted coffee. The average coffee plant produces about 1.5 pounds of roasted coffee per year. That is about 6000 beans per plant per year. So you can see it takes many trees to produce a sustainable profit for the grower. After picking, the beans must immediately undergo the next step in the harvesting process. Within 24 hours the cherry must begin the preparation process. This usually involves something called a “wet process.” The beans pass through a pulping machine which separates the bean from the skin and pulp. Next the beans are separated by weight as they pass through a series of water channels. This causes the smaller beans to float to the top. Then they pass through a series of rotating drums to complete the separation process. After the separation, the beans are placed into fermentation tanks to remove the mucilage (parenchyma) from the beans. This usually takes from 12 to 24 hours. Natural enzymes will cause this layer to dissolve. After this processing is complete the beans pass through a water bath and are now ready for drying. Drying can be done by spreading the beans out on mats or this can be done utilizing commercial dyers. The beans must be regularly raked or rotated. Once the moisture content is reduced to about 11% they are considered parchment coffee and are ready to be bagged for storage. Before the beans are roasted or exported they go through the hulling process. This removes the parchment layer from the wet processed bean. Then the beans are then sorted according to size by passing them through various size grates. They are also graded based on their color and lack of defects. Usually only the very best are roasted or used for export. The grading process can be done by machines or by hand. The coffee beans are ready for roasting. This takes place in specially designed roaster at a temperature of about 550 degrees Fahrenheit They are continually rotated or stirred to prevent scorching. Once they reach an internal temperature of 400 degrees they begin to turn brown and release a fragrant oil called caffeol that gives the coffee it unique flavor. Coffee Roasters can vary temperatures and times in the roaster oven to produce lighter or darker roast coffees. This involves crushing or chopping the beans to allow the maximum transfer of the flavor in the brewing process. While some prefer to purchase ground coffee beans more and more consumers are buying whole bean coffee and grinding the beans as needed. This allows for a fresher flavor and aroma. As you can see the preparation process is extensive. Many steps are required to bring the coffee beans from the field to brew your perfect cup of coffee each morning. I hope you have enjoyed this brief description of the whole process. 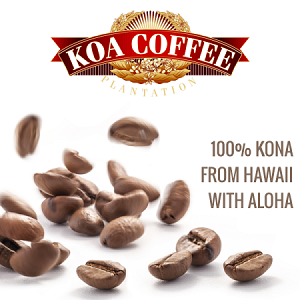 If you are ready to try Koa Premium Kona Coffee, please click on the ad here. Wayne and Sharon have be blessed to travel to various islands in the State of Hawaii. They have found that each island is unique with geographical and cultural differences. They have three children and seven grandchildren. They enjoy introducing their family and friends to the Hawaii they have come to love.